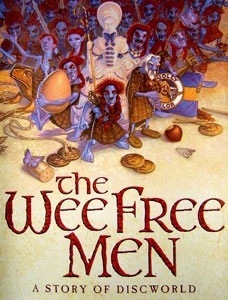 The Wee Free Men by Terry Pratchett or anything by Terry Pratchett would fit the bill for today’s challenge but The Wee Free Men was the first book I read by him and Tiffany Aching is one of my favourite female characters. The Nac Mac Feegle were hilarious and I just loved their parts. One aspect of Terry Pratchett’s writing that I really enjoy is how lighthearted it is and all of the books I have read by him have been really enjoyable and funny. I’d definitely recommend picking up one of his Discworld books if you want a laugh. I’m so sad that he has Alzheimer’s but books written with Baxter are not too bad.